Strong Protection - Built-in special RFID blocking material to protect all your valuable data - deny pickpockets scanning your passports, identity cards, credit cards, debit cards, smartcards, driver\'s licenses and other RFID Cards (13.56 MHz or higher). It could not shield non-smart cards or older low frequency 125 KHz such as the old style gate control system. 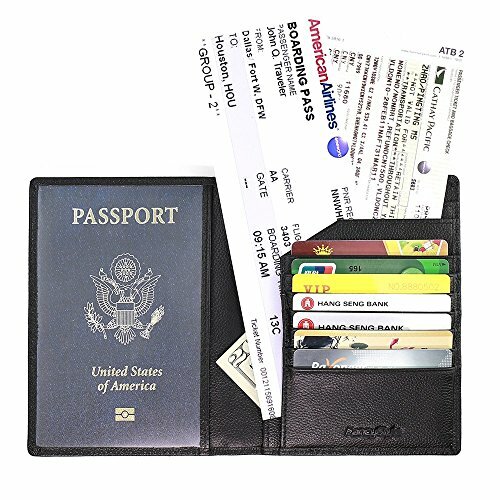 Large Capacity -- 1 clear passport slot and 1 hidden passport slot let you hold 2 to 3 passports. (could also hold cash, ticket, receipt, etc); 2 multifunctional slots which could hold cash, documents, etc); 7 credit card slots. Snug Slots - To ensure you insert and pull out your passport and cards smoothly. Bonus - Gift box wrapped & little random gift offered. No-Hassle 100% Money Back Guarantee - Not satisfied? You don\'t like it? Your dog seems not like it? No problem, contact us to return it and get a full refund or ask for a free replacement. Leather RFID blocking passport holder from FancyStyle.